Wedding pillows are great projects for parents, and make great gifts for friends. 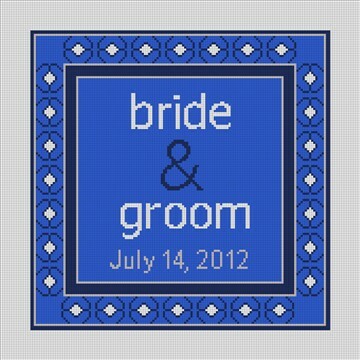 Each design can be personalized, the colors changed, and the fonts adjusted to the stitcher's or the bride-to-be's choice. Don't miss this opportunity to offer a truly special gift to your family or friend. All canvases are made on Zweigart Mono Deluxe canvas, and kits (optional) use DMC cotton embroidery floss.